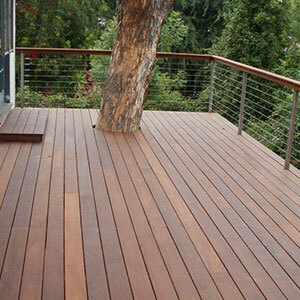 Also known as ironwood, ipe (pronounced “EE-pay”) is an extremely dense, tropical hardwood with exceptional durability and natural insect resistance. 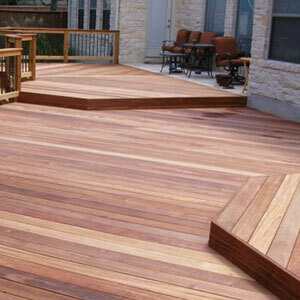 Ipe is three times harder than cedar, and it has the same fire rating as concrete and steel. 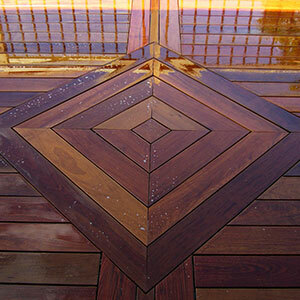 Ipe is also resistant to mildew and decay, making it ideal for projects in the Pacific Northwest. The wood can last over 25 years, and up to half a century with proper maintenance. Ipe's high oil and tannin content help ensure long-term durability, protecting the wood physically as well as preserving its warm, rich appearance. Plus, ipe’s density allows it to withstand the most demanding environments– from the famous Coney Island boardwalk to the wet, seasonal environments out here Oregon and Washington. So what happens when ipe’s natural strength meets conventional saws and drills? If your contractor isn’t careful, ipe can get the best of them. In fact, this wood is so strong that even professional contractors’ tools can quickly become blunted, and ipe will actually reject nails in a short time. That’s why every ipe project requires the specialized tools and knowledge of an experienced ipe craftsman. Due to its unique physical properties, ipe requires a master carpenter’s skill. At Creative Fences and Decks, we’ve been building ipe decks, fences, screens, pergolas, and planter boxes for over a decade, simply because we’re passionate about the beauty of the wood. Simply put, it’s what we love to do. So when it comes to your next project, you can rely on our attentive care and experience.